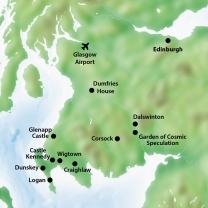 With a mild climate influenced by the Gulf Stream, gardens of Dumfries and especially Galloway are lush and richly planted with shrubs and trees from all over the world. May is a perfect time to visit the stunning gardens which will be in full springtime blossom. We stay initially at the comfortable, welcoming Dumfries House Lodge situated in the parkland near the House. We continue to Knockinaam Lodge in a secluded bay on the coast in Galloway. An exceptionally well-appointed small country house hotel with an excellent restaurant serving local, seasonal dishes. The hotel garden reaches down to the sea shore, bluebells grow on the hillside and wildlife can be seen early in the morning. Accompanied by Paddy Scott as tour leader, Paddy has a long involvement in the promotion of Scottish gardens. Meet in Glasgow Central train station at 11am to head south into Ayrshire to Dumfries House for an overnight stay in the Lodge. Lunch is served in the Woodlands restaurant. Afternoon visit of the gardens and the beautifully appointed 18C Palladian style house renovated after Prince Charles helped to save the contents and instigated the renovation of both house and gardens. Light supper in the Coach House café. Depart southwards to visit the amazing gardens created by Charles Jencks ‘Gardens of Cosmic Speculation’. An extensive garden with contemporary Land Art which ensures a smile and admiration of a remarkable concept. We continue to the gardens of Dalswinton near Dumfries, the gardens have a stunning aspect over the loch. We enjoy lunch in the house. Afternoon visit to Corsock, a glorious woodland garden at its best in May with flowering rhododendron, azalea, magnolia and maple and includes an interesting walled garden. We head west to the coast of Galloway to a small bay in a remote part of the coast, south of Portpatrick. 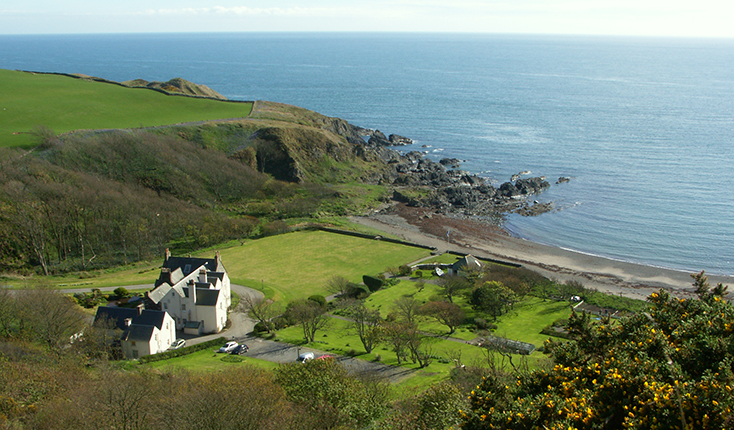 Knockinaam Lodge which in former times was a shooting lodge overlooks the Irish Sea. Dinner together in the hotel restaurant which has a notable chef. After breakfast we leave for the gardens of Logan House where we are guided by the knowledgeable head gardener, Alan Hannah. We continue to the nearby Logan Botanic Gardens, the western branch of Edinburgh Botanic gardens. Lunch at the garden restaurant. Afternoon visit to the walled gardens of Dunskey Estate near Portpatrick where the head gardener will give a fascinating tour of the garden. Return to Knockinaam Lodge and a chance to visit their vegetable garden. Dinner together in the Lodge. 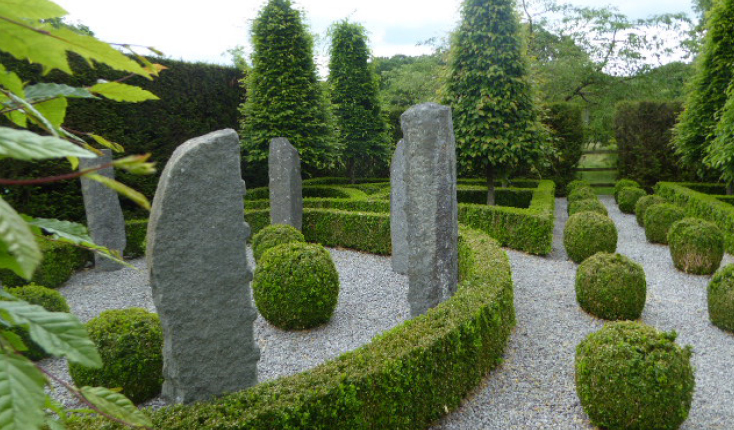 The gardens of Craichlaw have been restored and re-designed by the current owners with an excellent eye for innovative formal design. A collection of poultry with their decorative shed near the house leads on to woodlands surrounding a fishing loch. We continue to Wigtown to a small, well-planted private garden where we are invited for lunch. In the afternoon we head south with views towards the Isle of Man to visit the gardens of Claymoddie, created by Mary Nicholson and her late husband. Return along the peninsula to Knockinaam. Dinner together in the hotel. Morning visit to the well planted walled gardens of the ruins of Castle Kennedy and the landscaped parkland situated between two lochs created by the 2nd Earl of Stair in the 18C with extensive landscapes of terraces, mounds and avenues lined with araucarias. We continue to the extensive gardens of Glenwhan developed by Tessa Knot and her husband in the early 1970s. Carved out of a Scottish moorland, the views are spectacular over the Mull of Galloway over Luce Bay. The rich plantings are superb continuing up the hill to the edge of the moors. We lunch in the gardens. Return to Knockinaam Lodge. Dinner together on the final evening. Depart after breakfast to Glenapp Castle in Ayrshire. The surrounding gardens including the Italian Garden were designed by Gertrude Jekyll applying the principles of the arts and crafts movement. A long glasshouse has figs, grapes and exotic plants where we have lunch. We continue to Glasgow train station/airport for departures. Transport in a modern, comfortable minibus. Accommodation in luxury ensuite accommodation, delicious meals where indicated, garden visits, accompanied by Paddy Scott, tour leader. Alcoholic and soft drinks, items of a personal nature, tips. Travel to/from Glasgow. Full cover of fully comprehensive travel insurance. The climate in May can be bracing and/or sunny and warm. It is recommended to bring waterproofs, in case, a warm fleece and sturdy shoes for the garden visits. Smart Casual for the evening. Some gardens are extensive and some are on hillsides. Reasonable walking ability to enjoin the gardens is required.